You would normally know your own shoe size, but still the fit and width of a shoe can differ per brand and model. This is why you can find all the information you need to know about the fit of our collection here. You can measure the length of your feet to find out which size you exactly need. In the table below you can find an overview of all sizes and the corresponding length. These lengths are based on our shoes with a normal fit. Please check our product specifications for the fit of the shoe before you purchase your normal size. This fitting is based on an extensive fitting session with a model who has and average foot shape and size. Sometimes we advise you to purchase a size bigger or smaller for the perfect fitting. If your foot falls in between two shoe sizes and the product specifications specifies that the shoe has a normal fit, we advise you to order a (half) size larger. HOW DO I MEASURE MY FEET? Place your bare foot on a sheet of paper and draw a mark with your heel and your longest toe and draw a line between these two points. 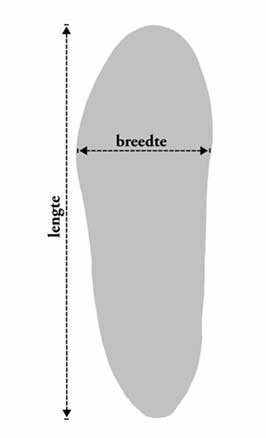 Measure the length of this line and check the table below to see which foot length corresponds to which shoe size. We advise you to measure both feet, as they have a different size and use the length of your longest foot. WHERE CAN I FIND THE SIZE OF A BAG? Each bag has a different size therefor we've measured all our bags seperately. You can find the size of our bags in the product description. WHAT IS THE SHAFT HEIGHT AND WIDTH OF THE SHOE? Please check the product specification for the height and the width of our shoes. The width is measured for size 37, a bigger shoe size has a larger width. The height does not differ per shoe size. The table can be used as an aid, however it may be that the shoe is a little smaller or larger. If you have purchased our shoes in the past please use your experience for choosing the right size and check the product specifications. Of course, you can always ask us to give you personal advice about the fit and size of a shoe. Please send us an e-mail or contact us via Facebook. and receive information about our latest collections, exclusive promotions and local events.